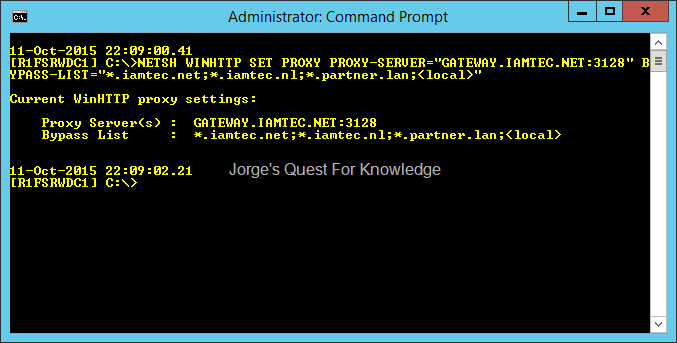 System Wide Proxy Settings « Jorge's Quest For Knowledge! Imagine you want to achieve something on a list of servers, and for that you want to use remote PowerShell. Good idea! You copy the script into a PowerShell command prompt window, and….., life is good! You copy the script into a PowerShell command prompt window, and….., life is suddenly not that good! What the heck! You try to troubleshoot this one, and it may appear to be a tough nut to crack! Although this error message may give you a hint in which direction you should look at, but in my personal case I got the “Access Denied” error. In summary, remote PowerShell while using NetBIOS names was successful and it failed while using FQDNs. At first I started to check the WinRM settings. Again, in my case there was nothing that gave me a hint what could be wrong, until I started to do some network traces, and that’s when I understand what could be wrong. In the network trace I saw, when using FQDNs, that the proxy server was being accessed. 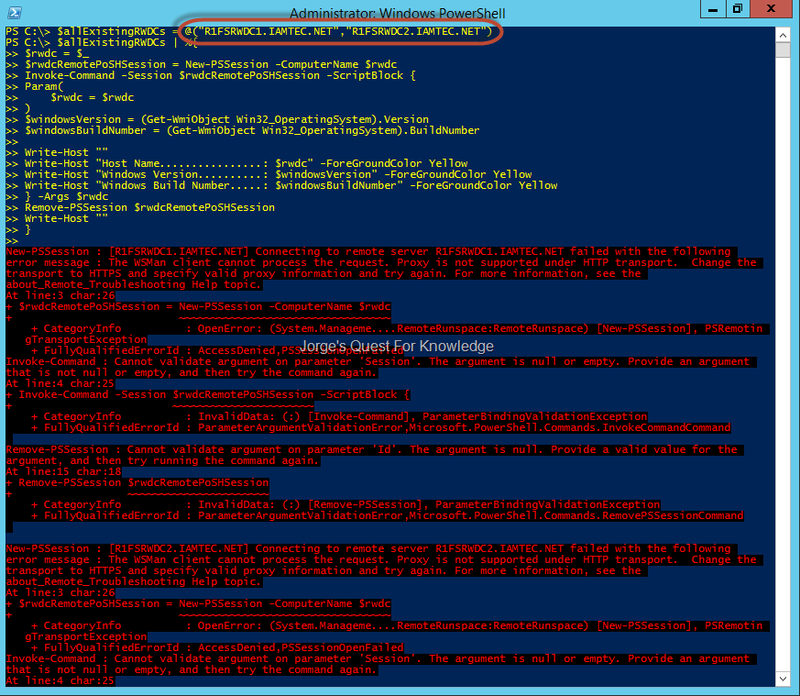 Now why the heck is remote PowerShell trying to access the server through the Proxy Server? With this blog post, I want to save you a long period of swearing and hair pulling. With <local>, I first thought that would support both FQDNs and NetBIOS names. WRONG!!! 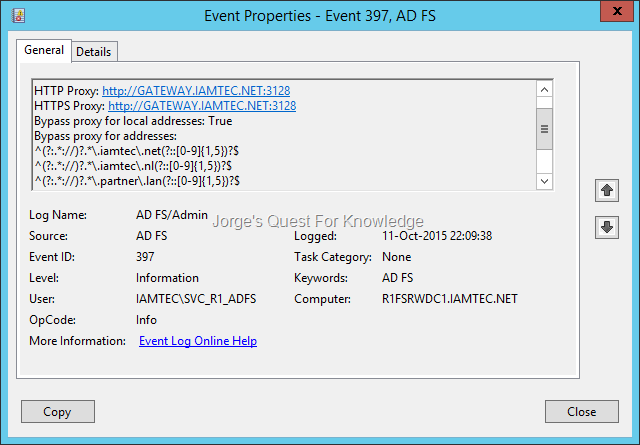 As mentioned in MS-KBQ262981, “<local>” only covers NetBIOS name style addresses, and NOT FQDNs. Therefore, any FQDN needs to be explicitly specified or be covered by some wildcard FQDN. So, what was the solution in my case? Answer: Add the wildcard FQDN that covers my internal AD forest. Therefore “*.IAMTEC.NET” should be added to the bypass list! 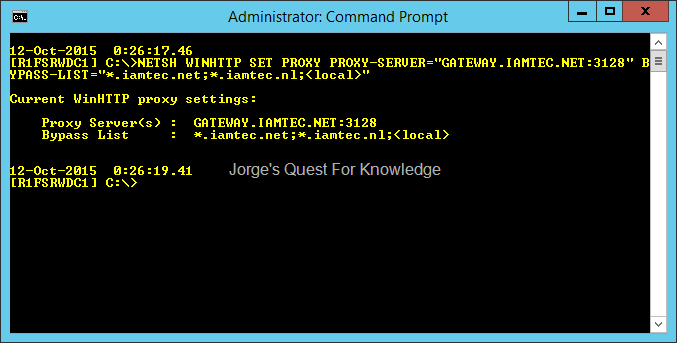 NETSH WINHTTP SET PROXY PROXY-SERVER="GATEWAY.IAMTEC.NET:3128" BYPASS-LIST="*.iamtec.net;*.iamtec.nl;<local>"
REMARK: when configuring the System Wide Proxy Settings, services that leverage those settings may exist that need to be restarted to consume the new configuration. One of those examples is ADFS. However, this does not apply to Remote PowerShell. Now let’s retry the script that uses the FQDN of the servers. Yes, life is good again! So your ADFS server requires access to the internet, what do you do? In general there are 2 options to get this done, being either directly bypassing any proxy or strait through the proxy. However, how do you tell ADFS to use a proxy? Let’s first think why you would have your ADFS servers accessing the internet. First of all, when you have a federation trust setup with a cloud-based system/application (e.g. Azure AD, Amazon Federation Web Services, etc.) that supports and publishes federation metadata, you of course want your ADFS servers to consume that federation metadata automatically, saving you manual work. This really helps you when a federation partner updates it’s Token Signing certificates when the old certificates are due to expire. The second and last reason is to be able to perform certificate chain validation and checking the revocation status of the certificate. This of course applies to any certificate issued by a certificate authority. More information about this can be found in (2015-10-10) Certificate Chain Validation And Revocation Status Checking In ADFS. When performing certificate chain validation of an external third-party certificate, access to the internet is required if the certificates of the root and/or the intermediate CA are not installed in the LocalMachine store. To be able to check for the revocation status of an external third-party certificate, access to the CRL distribution points is required. Achieving this by allowing the ADFS servers to bypass any proxy is the easiest way as you do not have to configure anything on the ADFS servers and you do not need to configure anything network related in addition. A huge downside is that there is no control who is accessing what on the internet. An ADFS server, which can be compared to a writeable domain controller, might misused to access compromsied web sites. A better way is to allow access to the internet through a proxy server. This helps you to tailor what you allow to be accessed and what you do not allow to be accessed on the internet from the ADFS servers. With the knowledge of what needs to be accessible by the ADFS servers you can now configure the proxy server to only allow that. Adjustments are needed if you are federating with a new partner that publishes federation metadata or a federation partner uses a third-party certificate from a third-party CA you do not yet trust. Of course cleanup is also required if for example a federation trust is decommissioned. When configuring the proxy server prevent configuring proxy server rules through the IPs of the targeted servers on the internet. As you do not have control on what a federation partner or a certificate issuer does, which regards to IP addressing, it is not recommended to use that. I prefer to allow access based upon the hostnames, or even just domains, used in the federation metadata URL, the AIA extension URLs and the CDP extension URLs, as that is most likely not to change. The information below applies to ADFS v2.x and higher! <Local Addresses> <== This only applies to NetBIOS name style addresses, and not (local) FQDNs! NETSH WINHTTP SET PROXY PROXY-SERVER="GATEWAY.IAMTEC.NET:3128" BYPASS-LIST="*.iamtec.net;*.iamtec.nl;*.partner.lan;<local>"
By default, ADFS starts the trust monitoring cycle every 24 hours (1440 minutes). When you check the ADFS Properties (Get-ADFSProperties), you will most likely see (if you did not change it!) that the “MonitoringInterval” property is configured with the value 1440. 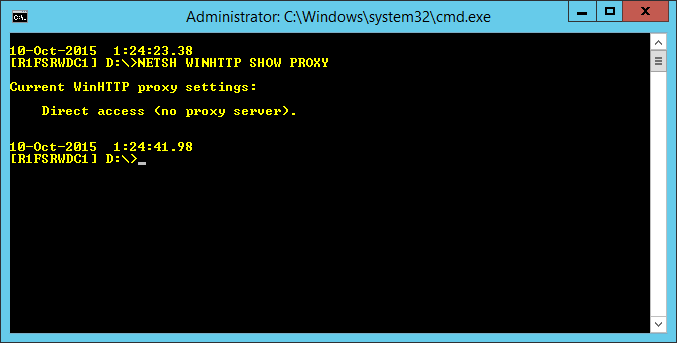 If you temporarily lower that value to, let’s say, 1 minute, you can actively see if the configured proxy settings are working and if ADFS is able to pass through the proxy. When ADFS initiates the trust monitoring cycle, you will see the following event ID. 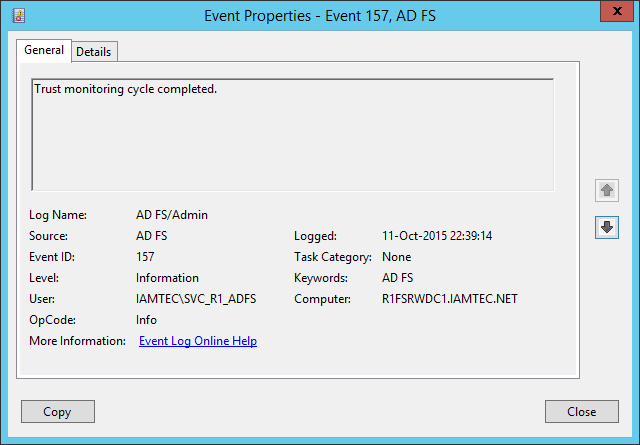 When ADFS completes the trust monitoring cycle, you will see the following event ID. Somewhere between those 2 event IDs you may find event IDs, but that depends if it was successful or not. 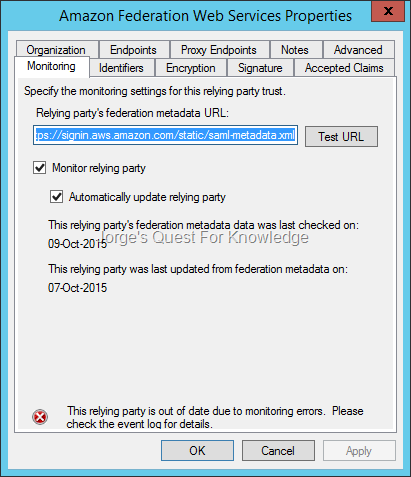 If a specific federation trust is configured with a federation metadata URL and at least monitoring is enabled, you will not find any event ID if the monitoring was successful for that federation trust. 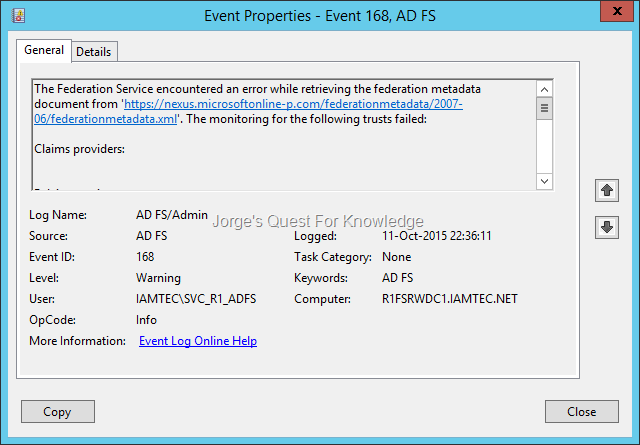 However, if for some reason the monitoring was not successful for a specific federation trust, you will find the following event ID stating that monitoring failed. Be aware, that the ‘LastMonitoredTime’ is updated, whether or not the monitoring was successful. Therefore, if you see an updated ‘LastMonitoredTime’ and no event ID exist for that specific federation trust (as shown in picture 9), you can be sure that access through the proxy using the configured proxy settings is successful! Remember that the ‘LastUpdateTime’ will only be updated, if there is something new to update!